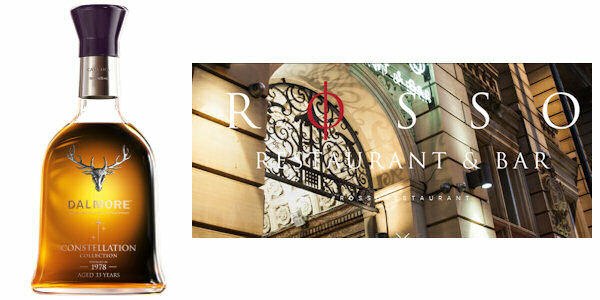 Rosso has long encapsulated the essence of good food and drink in a classic setting with a luxury edge. It seems fitting then, that it will be the first to bring to Manchester the finest bottle of whisky from Scotland’s premium distiller, The Dalmore. Settled in 1839, The Dalmore distillery has a history of defying convention to create bold and adventurous whiskies. The Dalmore Collection houses some of the rarest and oldest single malts in the world and for the first time, it will be bringing The Dalmore 1978 to Manchester – exclusively to Rosso. The 1978 has notes of almonds, peach and pear swirled into a rich mahogany gold. It is part of The Constellation Collection, a stunning family of 21 individual expressions - crafted at The Dalmore distillery between the years of 1964 and 1992. They have spent their lives finessing in the finest casks around the world before being bottled at natural cask strength and colour. Also on offer at Rosso, are the Dalmore 15, the 25, the Cigar Malt Reserve and the King Alexander III. All blends are tinged with the indomitable spirit of The Dalmore distillery, a spirit which has existed since Alexander Matheson settled on an isolated area on the banks of the Cromarty Firth as the place to find the best natural resources to make the very finest whisky. Master Distiller Richard Paterson will be personally delivering the 1978 and placing it squarely at the forefront of the finest shelf in the city. A third generation Master Distiller, Richard has spent many years honing his craft. He is one of the most recognised and highly revered experts in the whisky industry and testament to this are the many awards he has received for both the whiskies he produces and his own distilling challenge. The Dalmore marries perfectly with the Rosso experience. An atmosphere with surroundings to die for, Rosso blends a stylish interior, unforgettable menu, exclusive and luxurious drinks with unparalleled ambience to provide an unforgettable experience. The Dalmore Constellation Collection will add to a whisky shelf that’s already unparalleled anywhere outside of London.